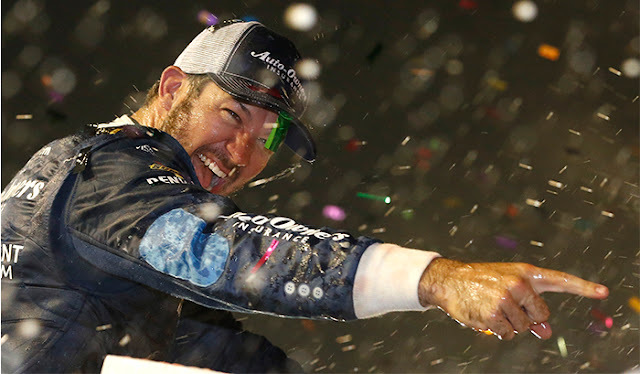 With a win in the Coca-Cola 600 already notched in his belt, Martin Truex Jr. scored a checkered flag in yet another one of NASCAR's crown jewels on Sunday: the Bojangles Southern 500 in Darlington. Driving the throwback No 78 Auto-Owners Camry, Truex was able to hold outrun Harvick to his second win of the season. "We've had a string of terrible bad luck lately," Truex said. "We've had super-fast race cars. ... I knew when the bad luck stopped coming, we would start racking them off. Tonight we weren't the best car, and we won for once. I just couldn't be more excited." He's just the eighth driver to score wins in both the Coca Cola 600 and Bojangles Southern 500 in the same season. If the season ended in Darlington, the Chase field would be set. Chris Buescher, sitting 30th, would be one of two rookies in the Chase - joining Chase Elliott who's sitting 12th in points. 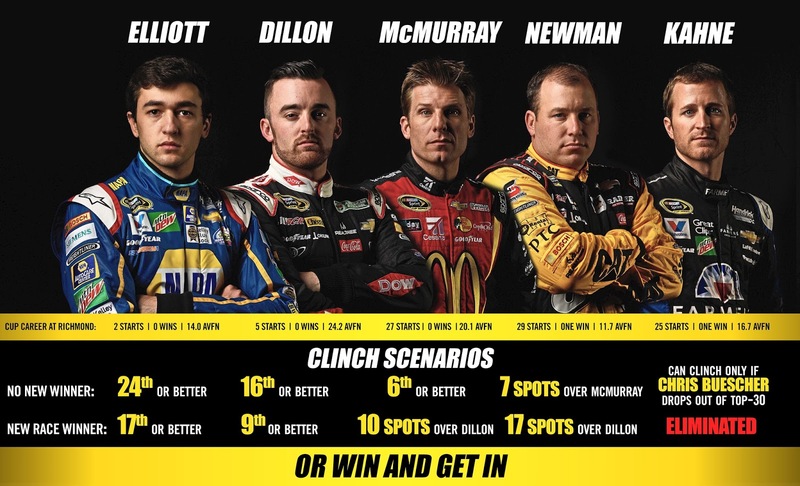 Austin Dillon would be making his first-ever Chase appearance and Jamie McMurray would make the NASCAR postseason for the second time. But there's still Richmond - and a pair of NASCAR vets with 12 Chase berths between them are looking to make one final push for the playoffs. 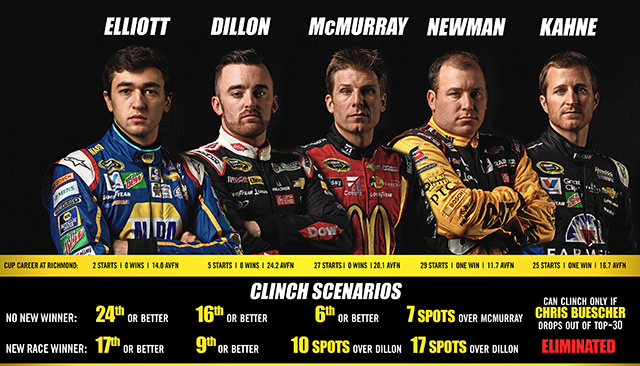 Check out the graphic above to see how the Chase bubble looks heading into the regular season finale. If math isn't your strong suit, just remember this: win and get in. 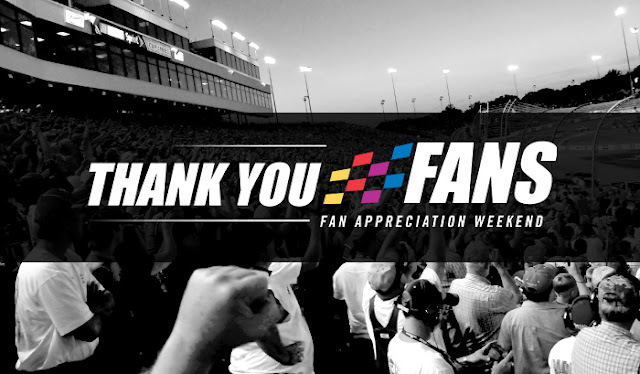 Fan Appreciation is an entire weekend devoted to showing our gratitude to race fans near and far for the enthusiastic support they have given our sport throughout the regular season. As we head into The Chase for the NASCAR Sprint Cup playoffs, there is no better time to tell our fans THANK YOU for another incredible year. From unprecedented driver access, to car decals, to a literal red carpet, this weekend is going to be unlike anything you’ve ever seen before. Check out rir.com/FANPRIZES to see the cool swag you can win now, and follow us on Twitter @RIRinsider to see the cool swag you can win while you’re here.